The Yokins shunts are available from 1A up to 15000A with an accuracy of 0.5% & 1% as per ISI248. Standard voltage drop is 50mV, 60mV & 75mV. Intermediate current ratings, other voltage outputs, better accuracy and purpose built shunts can be supplied. Shunts provide an accurate DC milli volt signal to drive ammeter indicators, overload protection and control devices, especially for higher amperage. It supplies Voltage drop proportional to the DC current which is measured and indicated by a moving-coil milli voltmeter with the dial calibrated in Amps. A current passing through the Shunt produces a proportional voltage drop. A moving coil instrument connected to shunt measures the voltage drop across the shunt terminals. Shunts are calibrated in such a way that they produce an accurately defined voltage drop (50mV, 60mV, 75mV and 150mV). 5 seconds withstand 10 times for 1 A to 500 Amp. 5 times for 600A to 2000Amp. Temp. Coefficient 0.002% per °C. Operating temp. -10°C to 55°C. We offer compact low cost shunts as well. 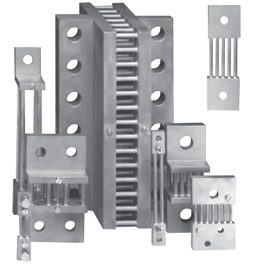 These shunts are often requested for special applications for small size or low cost applications. We generally recommend continuous load of ½ or 2/3 times the rated current, in these shunts. These can also be provided from 1A upto 15000A with an accuracy of 0.5% & 1%. Standard voltage drop applicable is 50mV, 60mV & 75mV.